Bleak, cold and grey. And tired. I arrived at Delapre Abbey in Northampton with my second coffee of the morning. I'd set off extra early for no good reason, leaving me ninety minutes to check out the course and then read a book in the car. I ran this marathon two years ago, but this time there were fewer people, the course felt noticeably emptier even on the first few laps when the 10k and half marathon runners were out at the same time. It was drier too, last time had been muddy, this time the mud was baked hard and the grassy sections were dry. This marathon is an intricate 3.5km loop around a lake, repeated 12 times. Every minute or two it changes. The lap starts in front on the abbey with a couple of tight turns through trees then opens onto an avenue. At the lake there is a narrow wiggle through some bushes onto a harder surface, then it follows the lake edge under trees. Here the ground is hard and uneven - baked mud and tree roots. A few minutes later you reach the end of the lake and take a sharp right (they could do with pruning the head height branches here), still following the lake, then winding through some more trees, now softer underfoot. A sharp right onto a wooden bridge, then across another sharp turn onto a short grassy section and back under the trees. Past the sailing club on an open section, grass or gravel, then more baked mud. Now the course turns away from the lake, slightly uphill, only noticeable on the last 2-3 laps. Another sharp right then left on some uneven ground, with a steep ascent for a couple of metres and back under the trees near the abbey. Then a sharp drop - accelerate then immediately brake - onto a gentle uphill as you run on grass out into a field, round a tree and back to the finish line. Getting water at the end of each lap helped, although I must have got the concentration wrong with my Gu electrolyte tables as I got stomach cramp from some of them. I ate a couple of jelly babies and one bite of a 9 bar but nothing else - getting better at not eating on the run. I chatted to another runner for much of the first half, then put my headphones on and ran on my own for the second half. While it is a scenic route, it does get boring with the laps and the grey skies and a bit of rain didn't help. There weren't as many runners as last time. Only 48 finished the marathon, so once the 10k and most of the half marathoners had finished it was quiet out there, and it lacked atmosphere. I set off a bit quick and faded at the end. Fairly typical. First lap in 18:05, then 18:20 - 19:00 for the rest of the first half. Halfway in 1:49:48 then my lap times deteriorated: 19:02, 20:27, 21:43, 21:49, 23:04 for 7-11, picking up for a 21:48 final lap. Here is the route. 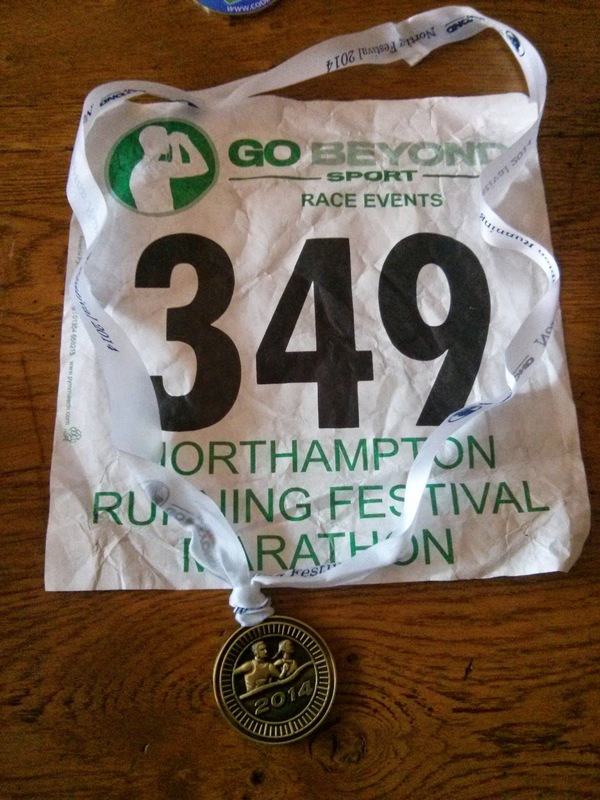 3:57:41 for marathon #59 and my fastest trail marathon to date! Focussing on getting sub-4 kept me going for the last ten miles, when the fatigue was kicking in.